Alta Vista Country Club in Placentia, Calif. had a couple of very special guests last month that made for an incredible member experience. In between PGA tour stops in Northern California and Puerto Rico, PGA Tour star and two-time major champion John Daly spent some time with his sponsors in Southern California. While in the area, he requested a chance to practice and play Alta Vista. “We’ve recently been a popular practice stop for Daly and other tour pros like Hunter Mahan and Ricky Barnes when they are the area,” says General Manger Karl Reul. 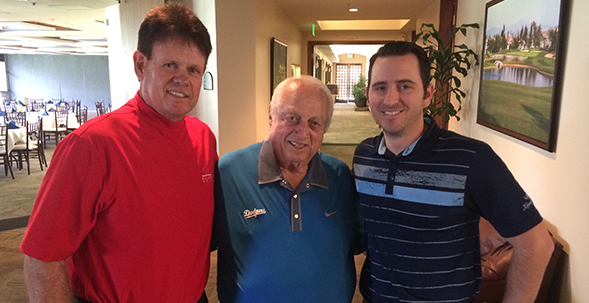 A few members were given the opportunity to play a few holes with him, and then the day got even more exciting for everyone when Los Angeles Dodger legend Tommy Lasorda stopped by to watch Daly play. After the round, both men had lunch in the clubhouse where Tommy told some of his legendary baseball stories for everyone on hand. The day turned into evening as everyone gathered out at the club’s new fire-pit where the two of them signed several autographs and took lots of great photos with club members and their kids.